Race and Michael lead the I-2 social studies class in Return Day, a post-election tradition, unique to Sussex County, Delaware where political opponents come together literally "bury the hatchet" and agree to work together for the good of the community. Seventh and eighth graders (Intermediate two) are encouraged to think analytically, study independently, work in small groups and share their knowledge with peers. Students are expected to bring projects to a satisfying conclusion, effectively communicate their ideas to others both in writing and orally. A priority is for students to gain self-confidence. Topics are presented with materials and perspective from more than one discipline, which leads to learning across the curriculum. Intermediate two students are encouraged to make interdisciplinary connections and to recognize that nothing exists in isolation. Students read a variety of literature. Book projects, class discussions, comprehension questions and written reading responses help students develop an appreciation of structure and theme in a variety of genres. The emphasis is on reading actively, observing and questioning to help students become familiar with the literary elements of plot, setting, characters, point of view and theme. Class discussion is very important and participation is required. Poetry is integrated into the regular readings and assignments, with a special focus during National Poetry month in April. Students practice the writing process, which reinforces the steps of prewriting, drafting, revision, conferencing, editing and keyboarding. Content for writing comes from personal experience, teacher-directed writing prompts and themes from literature reading. The Six Traits Writing Rubric is used to teach and assess components of all good writing. These include: ideas, organization, voice, word choice, sentence fluency and conventions. Assignments are varied, allowing students to examine and practice expository, descriptive, narrative and persuasive writing. Students are encouraged to think broadly and stretch beyond their comfort zone in their writing. Students expand their spelling and grammar skills through revision of their own work, in addition to other materials and activities. Prentice Hall Mathematics is used as the core of the Intermediate math curriculum. Frequent checkpoints include regular homework, quizzes, periodic projects, activity labs, class participation and preparedness and tests. Seventh grade mathematics explores pre-algebra and pre-geometry skills. Topics explored are: variables and expressions (algebraic expression - writing algebra involves operations and symbols as well as letters to use as "placeholders”), order of operations (algebra is a mathematical system with certain conventions; one of these conventions is consistency), writing and evaluating expressions (writing verbal statements as algebraic expressions), integers and absolute value (whole numbers and their negative opposites and the distance an integer is from zero), adding and subtracting integers, inductive reasoning and looking for a pattern (making conclusions based on patterns you observe), multiplying and dividing integers, coordinate plane, properties of numbers, simplifying algebraic expressions, variables and equations, solving equations, reasoning strategy (Try, Test, Retry), and solving inequalities. The graphing calculator is highly recommended and introduced in seventh grade. The students are asked to participate in class activities through discussion, sharing work on the board, small group work and projects. Students are required to keep a math binder that contains their notes, homework, graded tests and project work. The eighth graders study the traditional algebra one content. They use variables, exponents and order of operations; explore real numbers, patterns and functions; scatter plots, mean, median, mode and range; adding, subtracting, multiplying, dividing rational numbers; distributive property, properties of numbers, theoretical and experimental probability and probability of compound events. The eighth grade students solve equations and study the pythagorean theorem and learn more about applications of linear functions and slope. The graphing calculator is used throughout the year. Students are asked to participate in class activities through discussion, sharing work on the board, small group work and projects. Students are required to keep a math binder that contains their notes, homework, graded tests and project work. 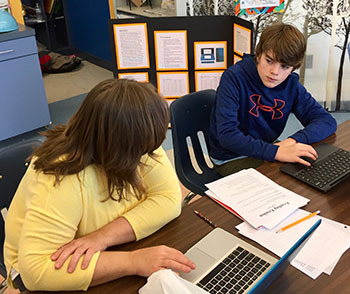 Dillon discusses the logistics of his project for the Sussex County Science Fair with teacher Amy Campagnone. 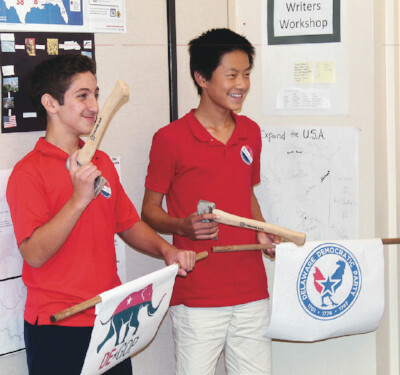 The social studies curriculum facilitates a student’s understanding that history is a record of human experiences linking the past to the present and future. Through the development of a strong foundation of the skills and processes of historical inquiry, students will be able to understand historical themes by acquiring and interpreting factual knowledge of time, places, ideas, institutions, cultures, people and events. Students will ultimately be able to integrate historical knowledge and a strong understanding of economics and government with contemporary issues to effectively participate as a citizen and as a lifelong learner in an increasingly global society. SCIENCE is an active enterprise in which students focus on scientific concepts and develop the ability to think critically through inquiry, investigation and analysis. The students are challenged to develop their ideas about proper scientific process and methodology through active, hands-on engagement. 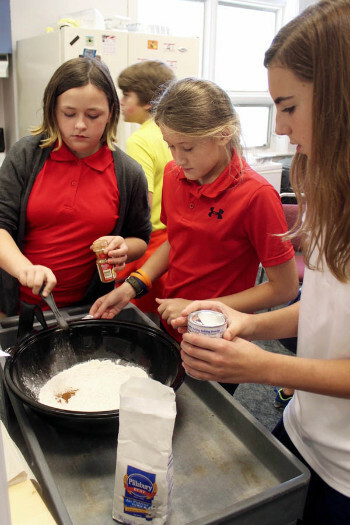 Students generate interesting questions, create hypotheses, design and conduct experiments and communicate their findings. Intermediate students complete an extended individual project. Students from grade six through grade eight are eligible to participate in the Sussex County Science Fair. The mission of the SCSF is to promote an interest in science and scientific investigation. The fair provides an opportunity for innovation and investigation as students showcase their science, mathematics and engineering projects. Many project-based, hands-on activities connect us with community partners and take us outside allowing us to investigate our woods, nature trail, two ponds, green house, gardens and goats on our 43 acre campus.